Customer Service, Attention to Detail & Craftsmanship. 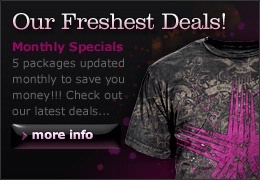 Fresh Ink is an apparel screen printing company based in London, Ontario. We are your full service company that will help you as much as you need through your entire project: from concepts to final product and everything in between. Because we are a smaller company, we are able to provide you with the personal attention that some larger companies simply can not. This includes answering any questions you may have, helping you in creating your design if needed, and picking up your order afterhours. Working from our studio also gives us the ability to charge you much less for our services, as we have a much lower overhead. Another thing about us is that we try to be a 'fun' company. Now, this doesn't mean that we slack off or have an air hockey table set up in our office or anything like that - it just means that we would like you to have a pleasurable, and hopefully memorable, experience with us - be it when you visit our website, or when you actually deal with us in person. This is especially important to us, because a lot of our business comes by word-of-mouth from our past customers.